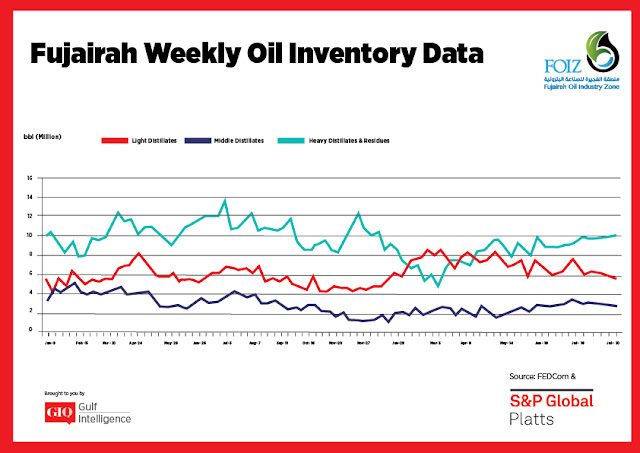 Oil product stocks at the Middle East's key oil hub of Fujairah fell 2.9% in the week to Monday, slipping to a five-week low as light distillate inventories lost more ground. Total oil stocks sank to 18.739 million barrels, down 559,000 barrels from a week earlier, according to the Fujairah Energy Data Committee. The biggest decline was in light distillate stocks, which dropped 10.35% to 5.741 million barrels, the lowest since the start of the year, the data showed. 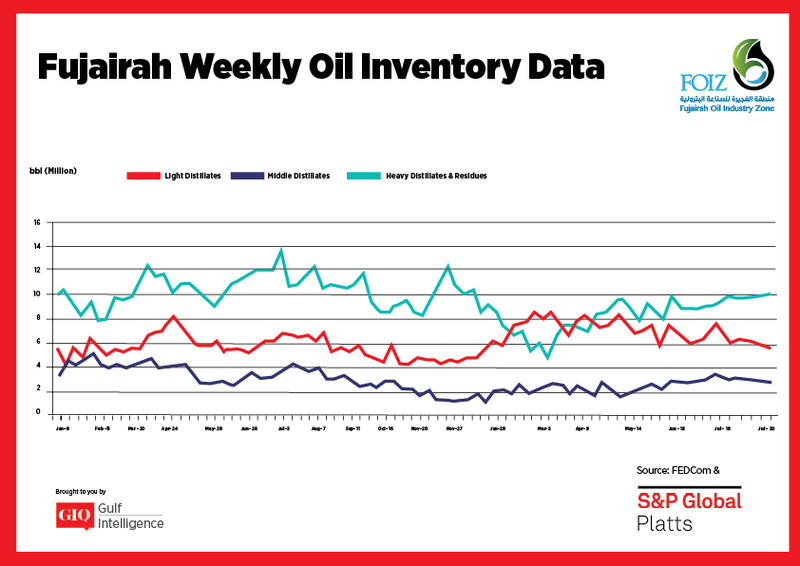 "Middle Eastern gasoline demand appears steady, while African demand is picking up on the evidence of recent tender purchases from South Africa, Tanzania, and Kenya," S&P Global Platts Analytics said in a report Wednesday. The state-owned Kuwait Petroleum Corporation (KPC) continued to be an active buyer of gasoline, seeking 25,000 mt of RON 91 gasoline for delivery in late August via a tender closing this week, the report added. Spot premiums for Arab Gulf RON 95 gasoline were at $3.95/b Tuesday. Stocks of middle distillates also slipped 1.2% to 2.676 million barrels, an eight-week low. "Arbitrage of jet fuel and gasoil to Europe could be complicated by the recent attack by Yemeni Houthi rebels against two Saudi crude tankers. The route to the Red Sea from the Indian Ocean passes through the Gulf of Aden and the narrow straits known as the Bab al-Mandab", Platts Analytics said. While there has been no sign of any impact to product tanker movements, the incident adds a further complication to already squeezed arbitrage flows. Jet cargoes have already been seen heading from the Middle East and India eastwards to Singapore instead of Europe. Stocks of heavy distillates and residues rose 1.3% to 10.322 million barrels, staying above 10 million barrels for the second week in a row and hitting the highest since December 11. 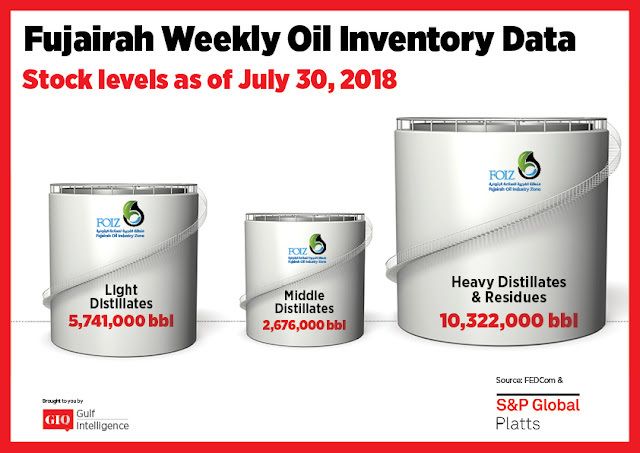 The higher inventories in Fujairah are in contrast to Singapore, where residue stocks dropped to a 6 1/2-year low of 16.196 million barrels last week on continued low arbitrage supply. Fujairah bunker demand had a slight improvement compared to last week, with more buying inquiries emerging after the recent lull.